Can powerful metal really fit in your pocket? Consider the size of your SUV's keys. 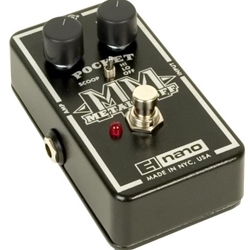 The Electro-Harmonix Nano Pocket Metal Muff Distortion Pedal takes the most powerful features from the popular Metal Muff and artfully squeezes them into a slick, die cast aluminum housing. Switch-selectable mid frequencies offer powerful scoops. With separate knobs for volume and distortion level, and a red LED indicating whether effect is on or off. Works with a 9V battery or optional AC adaptor.